Why is Redfin Called Redfin? What is Redfin? 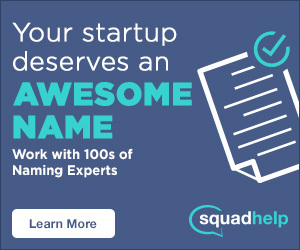 Likely you just whispered to yourself, “an online real estate company,” like Zillow. Close! 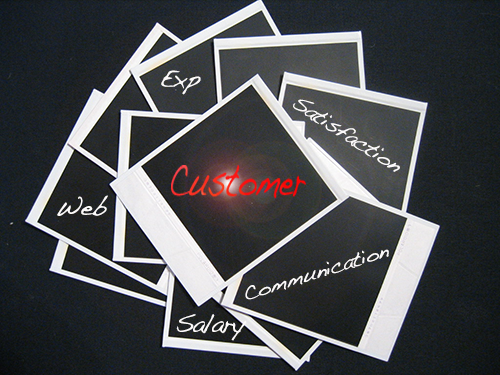 Although they have some commonalities, they have very different business models. Both companies have developed online search portals to view real estate information such as homes for sale and recently sold homes. But, and a big BUT, Redfin operates as an online brokerage. Unlike Zillow, they actually employe licensed real estate agents and make money when homes are purchased or sold. Contrarily, Zillow is a media company that generates revenue via ad placements and other lead generation techniques on their website. Very different value propositions and strategies. I wanted to clarify this disparity because it’s widely misunderstood. Redfin was founded in 2004 by three musketeers – David Eraker (recently founded Surefield), Michael Dougherty (who later went to work for Zillow) and David Selinger in Seattle, Washington. The company is currently in 67 US markets and is CEO’d by Seattle native, Glenn Kelman. Redfin (not Zillow, Apple or Google) was the early pioneer of map-based search. The idea to redefine the real estate landscape was derived from this technology discovery. Prior to launching their first product, Eraker discussed the business model with one of his neighbors in his small Capitol Hill apartment. This neighbor just happend to be Sami Inkinen, the founder of Trulia, which was recently purchased by Zillow for $3.5 billion. At the time, Inkinen was an intern at Microsoft, but later that year moved to San Francisco to launch Trulia. The story is remarkable – two neighbors in the same apartment complex were able to flip the real estate industry. Why is it called Redfin? Like car salesmen, real estate agents are paid a commission on the sale price of a home – they only make money when you pull out your wallet. For many, this pay structure creates a sense of distrust. Of course, if you have a relationship with your agent or they come highly recommended (a keyword for later), the situation is a little more comforting. Trust was problem numero uno. Eraker and team envisioned an end-to-end experience that actually developed friendships . Things like agent expertise, communication, reviews, recommendations and payment structure created buzz around how Redfin was planning to disrupt the real estate market. Additionally, Eraker came from a tech background, which gave him an edge over how most people viewed the future of technology and the problems it would solve. He believed Redfin could combine real estate information and satellite maps to create an intuitive finder – making it easier and more convenient for buyers to discover the perfect home. Eraker looked for a word that encoded “Friend” and “Finder,” which is how he discovered the anagram, “Redfin.” See Eraker’s tweet below. SEE ALSO: Why is it called Zillow? Redfin deal agents (meaning they have a real estate license) all make a base salary. This aims to control the trust variable. Agent bonuses are based on client recommendation scores (1-10). The higher the score, the more cash the agent pockets from the commissions. This controls the end-to-end brand experience. Similar to how Uber incorporates reviews to create a consistent experience. 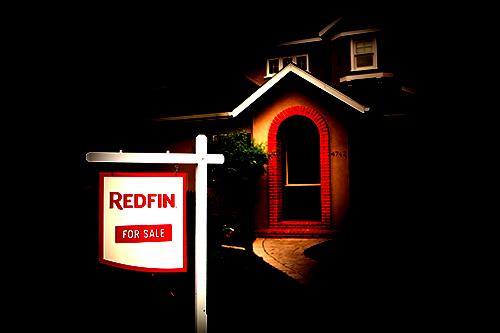 3% of the commission is collected by Redfin Inc after the sale of the home. Of that 3%, ~1% is passed along to the buyers, which is often put towards closing costs. I say approximately 1% because this refund is not a flat percentage fee, it’s calculated using a secret internal algorithm. However everyone does get some kind of refund (except in Oregon and Tennessee where the laws disallow it). The remaining ~2% is split between Redfin Inc. and the Redfin deal agent. In addition to a base salary, all Redfin deal agents get health benefits, get their MLS dues covered, don’t have to pay a desk fee and get their phone and gas stipends. Upward mobility does exist. Moving up the ladder is based on the number of houses sold and each step is rewarded with increased base salaries. Agent —> Sr. Agent —> Team Lead —> Managers. Associate agents help deal agents with home tours during times of high demand. These associates are Independent Contractors, they are not employed by Redfin. 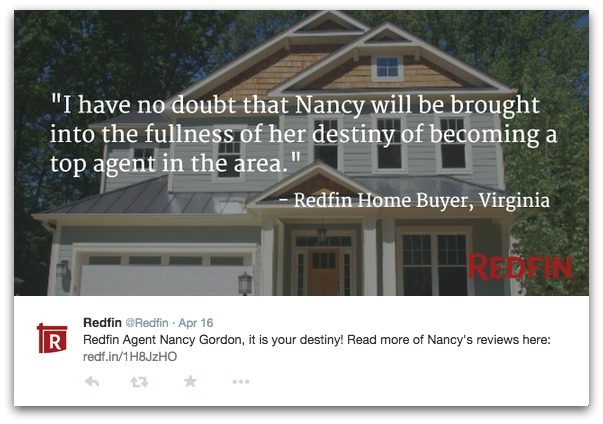 If you scroll through Redfin’s Twitter feed, you’ll quickly notice they do a great job of highlighting agent success stories. Yes, this social strategy is simple, but its repetitiveness is highly effective for two reasons: first, it makes the Redfin agent feel appreciated and second, it gives Redfin the ability to show off their agents. For every testimonial, they include a link to the agent’s dedicated profile page for further exploration. See how Redfin incorporated “Friend” and “Finder” in their recent commercial! Shouldn’t you be able to see “For Sale” signs night and day? Add simple lighting, glow in the dark spray or at the very least reflectors to capture more eyeballs. Steve Jobs was obsessed with simplicity. He created a brand trigger and a style statement by challenging the tradition of black headphones. Now you know: there was actually strategic thinking behind the white headphone design. Remember the commercials? Why are all real estate signs rectangular? Take a look around you right now. I’ll bet you the majority of objects around you have circular corners. Why not a circular sign to show the some subtle differentiation in the brand? What are some other simple sign changes you can think of? Comment at the bottom of the post! After writing this article, I understand why people are confused about how Redfin is different than Zillow. Last year, I was fortunate enough to purchase my first home in Seattle. At the beginning of the hunt, my agent and good friend (not a Redfin agent) would send me listings from the MLS. I was highly dependent on it. He’d send random emails and I’d look at the available inventory, but this meant I was only looking at new houses when he sent them. Not the best system, especially in a high demand real estate market like Seattle. Each day, the dependency on this email diminished. Instead of waiting on emails, I just downloaded Zillow’s mobile app for my iPhone. Why Zillow? Because at the time, when I thought real estate, I thought Zillow – an extremely valuable brand trigger. Now I could just search for new homes wherever and whenever – on the bus, on the couch, on a walk. For over 4 months, I only used Zillow’s app, until a friend of mine recommended I try Redfin, which was described to me as the same as Zillow, except they refresh their data more often. That’s the problem: word of mouth is driving a flawed comparison about the brand’s value proposition. Although I already had an agent, I didn’t know that Redfin aimed to help me find the perfect home with the perfect agent. So next time someone asks you “what is Redfin?” start by saying “It’s not the same as Zillow” and follow by describing their focus on methods that delight the customer.